Thank you to New York Spaces Magazine for including Margot, a jewel glass waterjet mosaic, in the Statements feature. To connect with New York Spaces on Facebook, click here and follow @NYSpacesmag on Twitter. 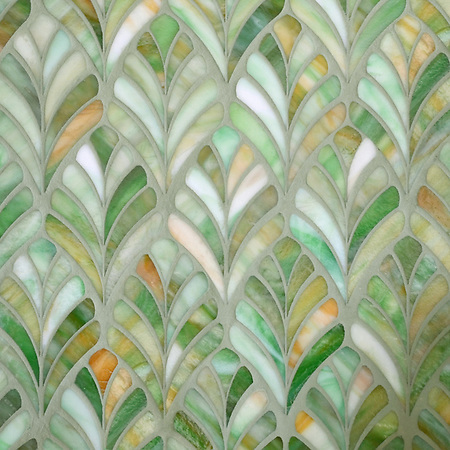 Margot, a jewel glass waterjet mosaic, is shown in Emerald. To see more Margot mosaics, click here. Click here to see more jewel toned glass mosaics. I am interested in the Margot, a jewel glass waterjet mosaic, in Emerald, will you please send me the price and installation instructions. Hi Elisabeth – thank you for your interest in our Margot mosaic! Have you visited a New Ravenna retailer yet to plan out this project? Our list of showrooms can be found here: http://www.newravenna.com/showrooms. Let us know if you have any trouble finding a retailer and we’ll make sure to put you in the right hands.